I'm standing in a queue at Harmoni, central Jakarta. In front of me, a toddler peers over her mother's shoulder at me. _”Apa itu?”, she asks - “What's that?” Her mother laughs and so do I. Being a white boy in Jakarta is a bit like being a minor celebrity – locals see you coming from a mile off, and they all want to ask questions, even the babies. Walking in Jakarta is not an easy thing to do – much of the time you are actually queuing up, and, in the continuous sweltering heat, any keen hiker's six-miles-an-hour stride is reduced to a leisurely, sweaty saunter. Why walk at all? Many of the Jakartans who stare at my red-faced gangly expat honky boy frame seem a little confused as to why, as a representative of the wealthy West, I would want to stroll the higgledy-piggledy, topsy-turvy streets. Admittedly, most would rather be in an over-air-conditioned cab when it comes to getting from point A to point B. But this blocks out all the bits in between and what if, like me, you don’t always have a particular point B in mind. But I'm jalan jalan, just walking around, makan angin, eating the wind. You can't always find pavements – many roads don't have them – you have to weave between mopeds, both parked and moving, cars, buses, seemingly randomly-placed traffic cones, mobile food salesmen pedalling around or lurking on corners. But, just as in London or any other city, perhaps the best way to get to know a place really well is by setting out on foot, muscles and sweat glands and all senses working overtime trying to understand, siphon, and deal with the environment. There's only so much to be gained from just being familiar with the micro-worlds of various tube stations or, over here, Jakartan hotels and expat-geared restaurants. So I do my best to explore the city on foot, and cab it back at night from one of the bars on Jalan Jaksa, when it's still approaching 30 degrees centigrade and the combination of Bintangs and Foreign Extra Guiness makes negotiating the only vaguely-designated walking areas even more problematic. It seems most locals aren't too keen on going on an ultimately unnecessary city hike either – a lady I was with last night was appalled when I asked the cab to pull over and let us amble down the final couple of streets. Granted, she was wearing high heels and needing to 'freshen up' but I wanted to listen to the frogs and watch the fruits bats… very un-gentlemanly. To say that the pavements are cluttered would be a vast understatement: you only have to take ten paces to encounter rats scuttling between drains and stinking rubbish heaps, large potted shrubs and impromptu fires blocking your path, un-neutered cats squealing territorially at one another. Heard of gots? They're the drains, the sewers, covered by very unstable cement blocks, and sometimes not at all. 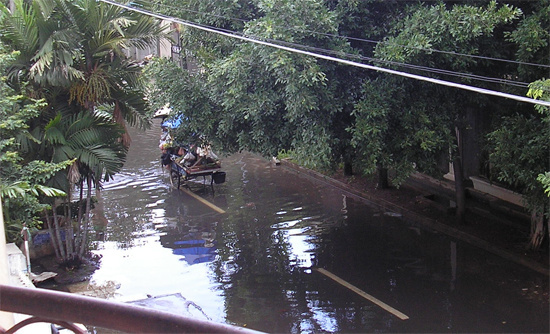 During the rainy season, when flash floods can make major roads impassable in just fifteen minutes, strolling around can be even more hazardous. Huge craters in the pavements and roads fill up with rainwater and sewerage, making each step a step into the unknown. The kids quite like swimming in this stuff though. It rained so violently last week that I began to believe that my room was actually deep within a large ship being severely battered by stormy seas. I wouldn't have been surprised had the room capsized. The far-from-flat pavements often have a toppled-over quality to them - they must appear like tower blocks or challenging Krypton Factor stages to small rodents. The paving stones themselves come in a variety of exciting patterns and colours, including three pink-ish hexagons stuck together. Friendly men sit around on them, leisurely playing chess, chatting, strumming acoustic guitars or selling street food. And as the whiteboy walks by, he's greeted by cries of “hello mister” or “where you from?” or “ojek [moped ride] mister?”. Then there are the bajaj drivers – pronounced 'badge-eye' – little three-wheel trucks imported from India and with no suspension. They pump out vast clouds of toxic fumes and all sound as if the exhaust has long since blown. The last time I took one, the driver decided to take us in his little three-wheeler straight up the wrong side of the dual carriageway - bikes, taxis and buses heading right for us. Not that this, nor the nearby traffic cop gesticulating with his flashing red baton, in any way tamed his enthusiasm for a minor adventure. Me, I'm just happy to be alive. In order to assess all these moving objects, I'd happily graft myself an owl-head, perhaps rotating at 33rpm. On a daily basis, street wanderers cross over busy routes comparable to the M4 in slow, permanently heavy, rush-hour traffic. The drivers of this myriad of (to me) utterly bewildering vehicles have incredible skills of precision. Granted, there are many accidents here but not anywhere near as many as you might expect given the continuous weaving, friendly honking and tomfoolery. Rules of the road are few and far between, or at least adherence to them is. Still, the middle of the road is probably the best place to walk any distance, owl head or no owl head. It may be the eleventh biggest city in the world, but the natural world is remarkably present here. There may be a lot of litter around, but leave it untended for a few weeks and, after the rats and cats have torn their way through it, some sort of plant or street food vendor will have made the previously filthy little spot their home. Urban travel in the good ol' UK, by whatever means, always seemed to me to be a case of, 'put up with it or blank it out, we'll be there soon', whereas here, most especially as a newcomer, you never really know what's likely to meet you round the corner, but rest assured something bewildering will, keeping your mind ticking over trying to work out apa itu? What's that? And where the hell is it heading?